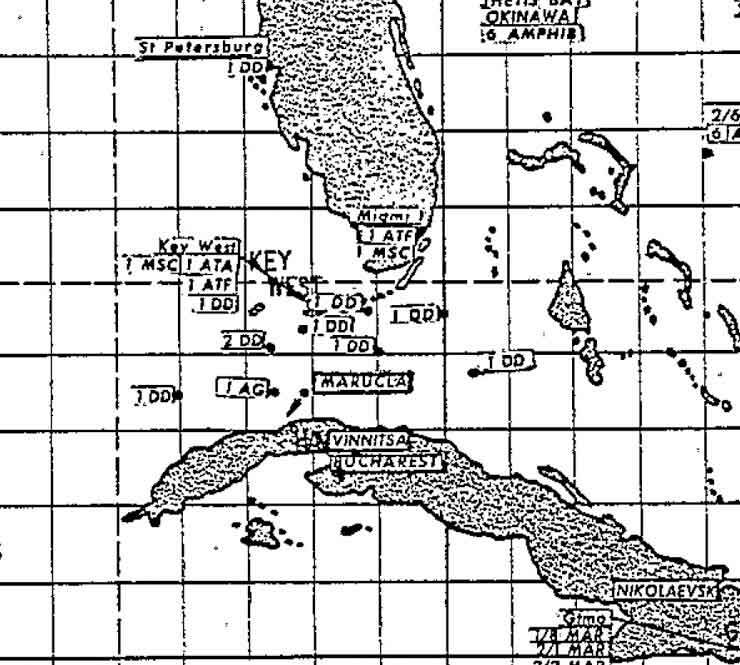 Map Displaying Locations of US and Soviet Ships during the Cuban Missile Crisis, Declassified by the US Navy. Fifty years ago this October, the United States, Soviet Union, and the world faced nuclear annihilation. This month the National Security Archive –and our many partners– will be posting newly declassified documents, publishing books, articles, and bulletins, participating in discussions on the Crisis. In an effort to keep track of the many CMC books, postings, and appearances, this posting will serve as an updated listing of all Cuban Missile Crisis news. Want to add something? Leave a comment! Former Archive fellow Michael Dobbs writes in the New York Times that “the lessons” of the the Cuban Missile Crisis are still being misused by politicians. Don’t fall for the same trap. Brush up on the Common Cuban Missile Crisis Myths. Of course, myths can be debunked by studying documents. Why not start with the newly-declassified dox on the US plan to invade Cuba, which would have costed an estimated 18,500 US casualties… assuming the Cubans did not take the “foolhardy step” of launching nuclear weapons. Check out the New York Times analysis of these documents. Archivista Peter Kornbluh was the first to examine the newly declassified RFK files on Cuba. See what he found. Also read Kornbluh’s article in Cigar Aficionado. And the Cold War International History Project’s Cuban Missile Crisis Bulletin is out! Check out the plethora of documents that editors Jim Hershberg, Christian Ostermann, and others have retrieved from behind the Iron, Bamboo, and Sugarcane Curtains. With an introduction “The Cuban Missile Crisis Just Isn’t What It Used to Be,” from National Security Archive director Tom Blanton. Follow Michael Dobbs, author of One Minute to Midnight, as he live tweets the Cuban Missile Crisis. Check out The Armageddon Letters – a transmedia project that uses a book, graphic novels, short films , podcasts (by James Blight and janet Lang), and blogs (by Kennedy, Khrushchev, and Castro) to illustrate the Cuban Missile Crisis from the perspectives of its actors. Read the The Soviet Cuban Missile Crisis: Castro, Mikoyan, Kennedy, Khrushchev, and the Missiles of November by Sergo Mikoyan and edited by Svetlana Savranskaya that contains new revelations of how the Soviets finally –a month after the Crisis– removed their tactical nuclear weapons from Cuba. On October 14th, 2012 at 12:30 attend or livestream the JFK Presidential Library’s discussion of the Crisis. Archivistas Peter Kornbluh and Svetlana Savranskaya were featured panelists. On October 15th, 2012 at 1:00 attend or livestream “Is the World More Dangerous 50 Years after the Cuban Missile Crisis?,” presented by the Woodrow Wilson Center’s Cold War International History Project. On October 17th, 2012 at 3:30 attend or livestream “The Soviet Cuban Missile Crisis: Castro, Mikoyan, Kennedy, Khrushchev and the Missiles of November,” also presented by the Woodrow Wilson Center’s Cold War International History Project. On October 26, 2012 from 9:00 AM – 8:30 PM attend a full day of expert discussion at The Global Cuban Missile Crisis – New Evidence, 50 Years On, presented by the the George Washington University’s Elliott School of International Affairs. ← New Documents Show US Military Estimated Invasion of Cuba Would Cost 18,500 US Casualties…. Assuming the Cubans Wouldn’t Take the “Foolhardy Step” of Using Nukes. On October 24, at 7:30 pm, the Minnesota Cuba Committee will host a forum, “The Cuban Missile Crisis, 50 Years Later.” It will take place at Room 1-147, Carlson School of Management, University of Minnesota West Bank, Minneapolis. More details at http://www.minnesotacubacommittee.org. I thought the revelation that Castro hired former Wafen SS officers to coordinate his defenses to be a particularly juicy bit of information … really tells us a lot about the nature of the Cuban revolution.